Kirkland, WA, June 27, 2013 — NetAcquire® Corporation announced today Data Delivery Service (DDS) network protocol support. The DDS technology provides an advanced network communications mechanism for connecting information providers with information consumers. This can be leveraged in many different NetAcquire applications including satellite telemetry and radar data distribution. “Data Distribution Service”, or DDS, and is a vendor-neutral publish/subscribe standard from the Object Management Group (OMG). The OMG is the standards group that is also responsible for other key network standards such as CORBA. Using DDS is very convenient from the NetAcquire Data Flow Designer. Unlike other DDS implementations, no programming is required to connect DDS network devices. For instance, DDS publishing is configured by simply drawing a graphic connection from the output of a decommutator block to the DDS publisher block. Receiving data (subscribing) is just as easy. NetAcquire DDS provides extensive user-configurable “quality-of-service” settings to control network delivery behavior and efficiency. This allows convenient selection of characteristics like best effort vs. reliable delivery and the acceptable amount of delivery latency over the network wire. Since NetAcquire systems run a real-time operating system, meeting the goal of offering end-to-end timeliness guarantees over the network is now within reach. In addition, the NetAcquire DDS option, when used in conjunction with the NetAcquire Data Recorder option, offers real-time recording and playback of DDS network traffic. Recording is supported for all DDS data types including (but not limited to) the “Measurand” data types used by the NetAcquire Data Flow DDS components. DDS traffic can be recorded and played back without explicit knowledge of the detailed data type definitions (DDS IDL), which greatly simplifies integration and use of the recorder during all stages of an application’s lifecycle as data definitions evolve over time. 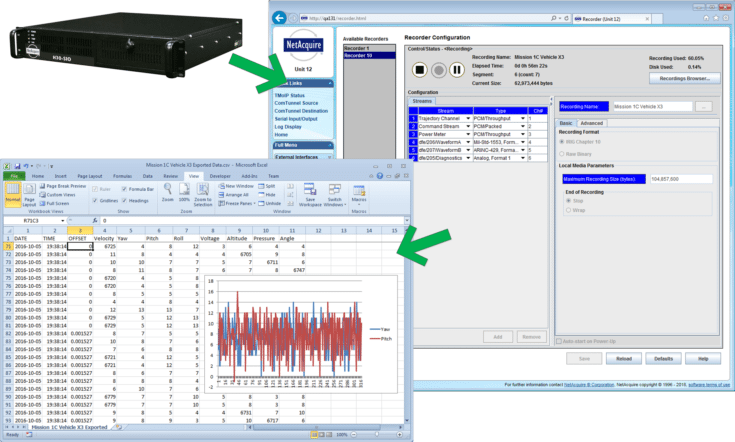 During playback, the NetAcquire system recreates the DDS network traffic with accurate timing for real-time data replay or simulation. Recording can also be configured with extra granularity to allow playback of all or just a portion of the DDS data traffic. NetAcquire DDS is the latest addition to the NetAcquire family of aerospace network data acquisition and control products. NetAcquire hardware and software is the ideal component for building enterprise-wide distributed communication and measurement systems. NetAcquire DDS is priced at $1,195, and is available now.